This article is about the means of transport. For other uses, see Vehicle (disambiguation). Buses are a common form of vehicles used for public transport. A vehicle (from Latin: vehiculum) is a machine that transports people or cargo. Vehicles include wagons, bicycles, motor vehicles (motorcycles, cars, trucks, buses), railed vehicles (trains, trams), watercraft (ships, boats), amphibious vehicles (screw-propelled vehicle, hovercraft), aircraft (airplanes, helicopters) and spacecraft. Boats were used between 4000 -3000 BC in Sumer, ancient Egypt and in the Indian Ocean. There is evidence of camel pulled wheeled vehicles about 4000–3000 BC. In 200 CE, Ma Jun built a south-pointing chariot, a vehicle with an early form of guidance system. Railways began reappearing in Europe after the Dark Ages. The earliest known record of a railway in Europe from this period is a stained-glass window in the Minster of Freiburg im Breisgau dating from around 1350. In 1515, Cardinal Matthäus Lang wrote a description of the Reisszug, a funicular railway at the Hohensalzburg Fortress in Austria. The line originally used wooden rails and a hemp haulage rope and was operated by human or animal power, through a treadwheel. 1769 Nicolas-Joseph Cugnot is often credited with building the first self-propelled mechanical vehicle or automobile in 1769. In Russia, in the 1780s, Ivan Kulibin developed a human-pedalled, three-wheeled carriage with modern features such as a flywheel, brake, gear box and bearings; however, it was not developed further. 1801 Richard Trevithick built and demonstrated his Puffing Devil road locomotive, which many believe was the first demonstration of a steam-powered road vehicle, though it could not maintain sufficient steam pressure for long periods and was of little practical use. 1817 Push bikes, draisines or hobby horses were the first human means of transport to make use of the two-wheeler principle, the draisine (or Laufmaschine, "running machine"), invented by the German Baron Karl von Drais, is regarded as the forerunner of the modern bicycle (and motorcycle). It was introduced by Drais to the public in Mannheim in summer 1817. 1885 Otto Lilienthal began experimental gliding and achieved the first sustained, controlled, reproducible flights. 2010 The number of road motor vehicles in operation worldwide surpassed the 1 billion mark – roughly one for every seven people. Treemap of the most common vehicles ever made, with total number made shown by size, and type/model labeled and distinguished by color. Fixed-wing airplanes, helicopters, and commercial jetliners are visible in the lower right corner at maximum zoom. There are over 1 billion bicycles in use worldwide. In 2002 there were an estimated 590 million cars and 205 million motorcycles in service in the world. At least 500 million Chinese Flying Pigeon bicycles have been made, more than any other single model of vehicle. The most-produced model of motor vehicle is the Honda Super Cub motorcycle, having passed 60 million units in 2008. The most-produced car model is the Toyota Corolla, with at least 35 million made by 2010. The most common fixed-wing airplane is the Cessna 172, with about 44,000 having been made as of 2017. The Soviet Mil Mi-8, at 17,000, is the most-produced helicopter. The top commercial jet airliner is the Boeing 737, at about 10,000 in 2018. Locomotion consists of a means that allows displacement with little opposition, a power source to provide the required kinetic energy and a means to control the motion, such as a brake and steering system. By far, most vehicles use wheels which employ the principle of rolling to enable displacement with very little rolling friction. It is essential that a vehicle have a source of energy to drive it. Energy can be extracted from external sources, as in the cases of a sailboat, a solar-powered car, or an electric streetcar that uses overhead lines. Energy can also be stored, provided it can be converted on demand and the storing medium's energy density and power density are sufficient to meet the vehicle's needs. Human power is a simple source of energy that requires nothing more than humans. Despite the fact that humans cannot exceed 500 W (0.67 hp) for meaningful amounts of time, the land speed record for human-powered vehicles (unpaced) is 133 km/h (83 mph), as of 2009 on a recumbent bicycle. The most common type of energy source is fuel. External combustion engines can use almost anything that burns as fuel, whilst internal combustion engines and rocket engines are designed to burn a specific fuel, typically gasoline, diesel or ethanol. Another common medium for storing energy is batteries, which have the advantages of being responsive, useful in a wide range of power levels, environmentally friendly, efficient, simple to install, and easy to maintain. Batteries also facilitate the use of electric motors, which have their own advantages. On the other hand, batteries have low energy densities, short service life, poor performance at extreme temperatures, long charging times, and difficulties with disposal (although they can usually be recycled). Like fuel, batteries store chemical energy and can cause burns and poisoning in event of an accident. Batteries also lose effectiveness with time. The issue of charge time can be resolved by swapping discharged batteries with charged ones; however, this incurs additional hardware costs and may be impractical for larger batteries. Moreover, there must be standard batteries for battery swapping to work at a gas station. Fuel cells are similar to batteries in that they convert from chemical to electrical energy, but have their own advantages and disadvantages. Electrified rails and overhead cables are a common source of electrical energy on subways, railways, trams, and trolleybuses. Solar energy is a more modern development, and several solar vehicles have been successfully built and tested, including Helios, a solar-powered aircraft. Nuclear power is a more exclusive form of energy storage, currently limited to large ships and submarines, mostly military. Nuclear energy can be released by a nuclear reactor, nuclear battery, or repeatedly detonating nuclear bombs. There have been two experiments with nuclear-powered aircraft, the Tupolev Tu-119 and the Convair X-6. Flywheels store energy in a spinning mass. Because a light and fast rotor is energetically favorable, flywheels can pose a significant safety hazard. Moreover, flywheels leak energy fairly quickly and affect a vehicle's steering through the gyroscopic effect. 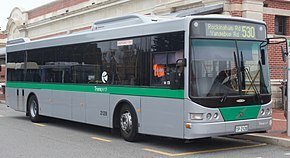 They have been used experimentally in gyrobuses. Wind energy is used by sailboats and land yachts as the primary source of energy. It is very cheap and fairly easy to use, the main issues being dependence on weather and upwind performance. Balloons also rely on the wind to move horizontally. Aircraft flying in the jet stream may get a boost from high altitude winds. Compressed gas is currently an experimental method of storing energy. In this case, compressed gas is simply stored in a tank and released when necessary. Like elastics, they have hysteresis losses when gas heats up during compression. Gravitational potential energy is a form of energy used in gliders, skis, bobsleds and numerous other vehicles that go down hill. Regenerative braking is an example of capturing kinetic energy where the brakes of a vehicle are augmented with a generator or other means of extracting energy. When needed, the energy is taken from the source and consumed by one or more motors or engines. Sometimes there is an intermediate medium, such as the batteries of a diesel submarine. Most motor vehicles have internal combustion engines. They are fairly cheap, easy to maintain, reliable, safe and small. Since these engines burn fuel, they have long ranges but pollute the environment. A related engine is the external combustion engine. An example of this is the steam engine. Aside from fuel, steam engines also need water, making them impractical for some purposes. Steam engines also need time to warm up, whereas IC engines can usually run right after being started, although this may not be recommended in cold conditions. Steam engines burning coal release sulfur into the air, causing harmful acid rain. A modern scooter in Taiwan. While intermittent internal combustion engines were once the primary means of aircraft propulsion, they have been largely superseded by continuous internal combustion engines: gas turbines. Turbine engines are light and, particularly when used on aircraft, efficient. On the other hand, they cost more and require careful maintenance. They can also be damaged by ingesting foreign objects, and they produce a hot exhaust. Trains using turbines are called gas turbine-electric locomotives. Examples of surface vehicles using turbines are M1 Abrams, MTT Turbine SUPERBIKE and the Millennium. Pulse jet engines are similar in many ways to turbojets, but have almost no moving parts. For this reason, they were very appealing to vehicle designers in the past; however their noise, heat and inefficiency has led to their abandonment. A historical example of the use of a pulse jet was the V-1 flying bomb. Pulse jets are still occasionally used in amateur experiments. With the advent of modern technology, the pulse detonation engine has become practical and was successfully tested on a Rutan VariEze. While the pulse detonation engine is much more efficient than the pulse jet and even turbine engines, it still suffers from extreme noise and vibration levels. Ramjets also have few moving parts, but they only work at high speed, so that their use is restricted to tip jet helicopters and high speed aircraft such as the Lockheed SR-71 Blackbird. Rocket engines are primarily used on rockets, rocket sleds and experimental aircraft. Rocket engines are extremely powerful. The heaviest vehicle ever to leave the ground, the Saturn V rocket, was powered by five F-1 rocket engines generating a combined 180 million horsepower (134.2 gigawatt). Rocket engines also have no need to "push off" anything, a fact that the New York Times denied in error. Rocket engines can be particularly simple, sometimes consisting of nothing more than a catalyst, as in the case of a hydrogen peroxide rocket. This makes them an attractive option for vehicles such as jet packs. Despite their simplicity, rocket engines are often dangerous and susceptible to explosions. The fuel they run off may be flammable, poisonous, corrosive or cryogenic. They also suffer from poor efficiency. For these reasons, rocket engines are only used when absolutely necessary. Electric motors are used in electric vehicles such as electric bicycles, electric scooters, small boats, subways, trains, trolleybuses, trams and experimental aircraft. Electric motors can be very efficient: over 90% efficiency is common. Electric motors can also be built to be powerful, reliable, low-maintenance and of any size. Electric motors can deliver a range of speeds and torques without necessarily using a gearbox (although it may be more economical to use one). Electric motors are limited in their use chiefly by the difficulty of supplying electricity. Compressed gas motors have been used on some vehicles experimentally. They are simple, efficient, safe, cheap, reliable and operate in a variety of conditions. One of the difficulties met when using gas motors is the cooling effect of expanding gas. These engines are limited by how quickly they absorb heat from their surroundings. The cooling effect can, however, double as air conditioning. Compressed gas motors also lose effectiveness with falling gas pressure. Ion thrusters are used on some satellites and spacecraft. They are only effective in a vacuum, which limits their use to spaceborne vehicles. Ion thrusters run primarily off electricity, but they also need a propellant such as caesium, or more recently xenon. Ion thrusters can achieve extremely high speeds and use little propellant; however they are power-hungry. The mechanical energy that motors and engines produce must be converted to work by wheels, propellers, nozzles, or similar means. Aside from converting mechanical energy into motion, wheels allow a vehicle to roll along a surface and, with the exception of railed vehicles, to be steered. Wheels are ancient technology, with specimens being discovered from over 5000 years ago. Wheels are used in a plethora of vehicles, including motor vehicles, armoured personnel carriers, amphibious vehicles, airplanes, trains, skateboards and wheelbarrows. Nozzles are used in conjunction with almost all reaction engines. Vehicles using nozzles include jet aircraft, rockets and personal watercraft. While most nozzles take the shape of a cone or bell, some unorthodox designs have been created such as the aerospike. Some nozzles are intangible, such as the electromagnetic field nozzle of a vectored ion thruster. Continuous track is sometimes used instead of wheels to power land vehicles. Continuous track has the advantages of a larger contact area, easy repairs on small damage, and high maneuverability. Examples of vehicles using continuous track are tanks, snowmobiles and excavators. Two continuous tracks used together allow for steering. The largest vehicle in the world, the Bagger 288, is propelled by continuous tracks. Propellers (as well as screws, fans and rotors) are used to move through a fluid. Propellers have been used as toys since ancient times, however it was Leonardo da Vinci who devised what was one of the earliest propeller driven vehicles, the "aerial-screw". In 1661, Toogood & Hays adopted the screw for use as a ship propeller. Since then, the propeller has been tested on many terrestrial vehicles, including the Schienenzeppelin train and numerous cars. In modern times, propellers are most prevalent on watercraft and aircraft, as well as some amphibious vehicles such as hovercraft and ground effect vehicles. Intuitively, propellers cannot work in space as there is no working fluid, however some sources have suggested that since space is never empty, a propeller could be made to work in space. Similarly to propeller vehicles, some vehicles use wings for propulsion. Sailboats and sailplanes are propelled by the forward component of lift generated by their sails/wings. Ornithopters also produce thrust aerodynamically. Ornithopters with large rounded leading edges produce lift by leading-edge suction forces. Paddle wheels are used on some older watercraft and their reconstructions. These ships were known as paddle steamers. Because paddle wheels simply push against the water, their design and construction is very simple. The oldest such ship in scheduled service is the Skibladner. Many pedalo boats also use paddle wheels for propulsion. Screw-propelled vehicles are propelled by auger-like cylinders fitted with helical flanges. Because they can produce thrust on both land and water, they are commonly used on all-terrain vehicles. The ZiL-2906 was a Soviet-designed screw-propelled vehicle designed to retrieve cosmonauts from the Siberian wilderness. All or almost all of the useful energy produced by the engine is usually dissipated as friction; so minimising frictional losses is very important in many vehicles. The main sources of friction are rolling friction and fluid drag (air drag or water drag). Wheels have low bearing friction and pneumatic tyres give low rolling friction. Steel wheels on steel tracks are lower still. Aerodynamic drag can be reduced by streamlined design features. Friction is desirable and important in supplying traction to facilitate motion on land. Most land vehicles rely on friction for accelerating, decelerating and changing direction. Sudden reductions in traction can cause loss of control and accidents. Most vehicles, with the notable exception of railed vehicles, have at least one steering mechanism. Wheeled vehicles steer by angling their front or rear wheels. The B-52 Stratofortress has a special arrangement in which all four main wheels can be angled. Skids can also be used to steer by angling them, as in the case of a snowmobile. Ships, boats, submarines, dirigibles and aeroplanes usually have a rudder for steering. On an airplane, ailerons are used to bank the airplane for directional control, sometimes assisted by the rudder. With no power applied, most vehicles come to a stop due to friction. But it is often required to stop a vehicle faster than by friction alone: so almost all vehicles are equipped with a braking system. Wheeled vehicles are typically equipped with friction brakes, which use the friction between brake pads (stators) and brake rotors to slow the vehicle. Many airplanes have high performance versions of the same system in their landing gear for use on the ground. A Boeing 757 brake, for example, has 3 stators and 4 rotors. The Space Shuttle also uses frictional brakes on its wheels. As well as frictional brakes, hybrid/electric cars, trolleybuses and electric bicycles can also use regenerative brakes to recycle some of the vehicle's potential energy. High-speed trains sometimes use frictionless Eddy-current brakes; however widespread application of the technology has been limited by overheating and interference issues. Aside from landing gear brakes, most large aircraft have other ways of decelerating. In aircraft, air brakes are aerodynamic surfaces that create friction, with the air flow causing the vehicle to slow. These are usually implemented as flaps that oppose air flow when extended and are flush with aircraft when retracted. Reverse thrust is also used in many aeroplane engines. Propeller aircraft achieve reverse thrust by reversing the pitch of the propellers, while jet aircraft do so by redirecting their engine exhaust forwards. On aircraft carriers, arresting gears are used to stop an aircraft. Pilots may even apply full forward throttle on touchdown, in case the arresting gear does not catch and a go around is needed. Parachutes are used to slow down vehicles travelling very fast. Parachutes have been used in land, air and space vehicles such as the ThrustSSC, Eurofighter Typhoon and Apollo Command Module. Some older Soviet passenger jets had braking parachutes for emergency landings. Boats use similar devices called sea anchors to maintain stability in rough seas. To further increase the rate of deceleration or where the brakes have failed, several mechanisms can be used to stop a vehicle. Cars and rolling stock usually have hand brakes that, while designed to secure an already parked vehicle, can provide limited braking should the primary brakes fail. A secondary procedure called forward-slip is sometimes used to slow airplanes by flying at an angle, causing more drag. Category N: motor vehicles for the carriage of goods. Category O: trailers and semi-trailers. European Community, is based on the Community's WVTA (whole vehicle type-approval) system. Under this system, manufacturers can obtain certification for a vehicle type in one Member State if it meets the EC technical requirements and then market it EU-wide with no need for further tests. Total technical harmonization already has been achieved in three vehicle categories (passenger cars, motorcycles, and tractors) and soon will extend to other vehicle categories (coaches and utility vehicles). It is essential that European car manufacturers be ensured access to as large a market as possible. While the Community type-approval system allows manufacturers to benefit fully from internal market opportunities, worldwide technical harmonization in the context of the United Nations Economic Commission for Europe (UNECE) offers a market beyond European borders. In many cases, it is unlawful to operate a vehicle without a license or certification. The least strict form of regulation usually limits what passengers the driver may carry or prohibits them completely (e.g., a Canadian ultra-light license without endorsements). The next level of licensing may allow passengers, but without any form of compensation or payment. A private driver's license usually has these conditions. Commercial licenses that allow the transport of passengers and cargo are more tightly regulated. The most strict form of licensing is generally reserved for school buses, hazardous materials transports and emergency vehicles. The driver of a motor vehicle is typically required to hold a valid driver's license while driving on public lands, whereas the pilot of an aircraft must have a license at all times, regardless of where in the jurisdiction the aircraft is flying. Vehicles are often required to be registered. Registration may be for purely legal reasons, for insurance reasons or to help law enforcement recover stolen vehicles. Toronto Police Service, for example, offers free and optional bicycle registration online. On motor vehicles, registration often takes the form of a vehicle registration plate, which makes it easy to identify a vehicle. In Russia, trucks and buses have their licence plate numbers repeated in large black letters on the back. On aircraft, a similar system is used where a tail number is painted on various surfaces. Like motor vehicles and aircraft, watercraft also have registration numbers in most jurisdictions, however the vessel name is still the primary means of identification as has been the case since ancient times. For this reason, duplicate registration names are generally rejected. In Canada, boats with an engine power of 10 hp (7.5 kW) or greater require registration, leading to the ubiquitous "9.9 hp (7.4 kW)" engine. Registration may be conditional on the vehicle being approved for use on public highways, as in the case of the UK and Ontario. Many US states also have requirements for vehicles operating on public highways. Aircraft have more stringent requirements, as they pose a high risk of damage to people and property in event of an accident. In the US, the FAA requires aircraft to have an airworthiness certificate. Because US aircraft must be flown for some time before they are certified, there is a provision for an experimental airworthiness certificate. FAA experimental aircraft are restricted in operation, including no overflights of populated areas, in busy airspace or with unessential passengers. Materials and parts used in FAA certified aircraft must meet the criteria set forth by the technical standard orders. In many jurisdictions, the operator of a vehicle is legally obligated to carry safety equipment with or on them. Common examples include seat belts in cars, helmets on motorcycles and bicycles, fire extinguishers on boats, buses and airplanes and life jackets on boats and commercial aircraft. Passenger aircraft carry a great deal of safety equipment including inflatable slides are rafts, oxygen masks, oxygen tanks, life jackets, satellite beacons and first aid kits. Some equipment such as life jackets has led to debate regarding their usefulness. In the case of Ethiopian Airlines Flight 961, the life jackets saved many people but also led to many deaths when passengers inflated their vests prematurely. There are specific real-estate arrangements made to allow vehicles to travel from one place to another. The most common such arrangements are public highways, where appropriately licensed vehicles can navigate without hindrance. These highways are on public land and are maintained by the government. Similarly, toll routes are open to the public after paying a toll. These routes and the land they rest on may be government or privately owned or a combination of both. Some routes are privately owned but grant access to the public. These routes often have a warning sign stating that the government does not maintain the way. An example of this are byways in England and Wales. In Scotland, land is open to un-motorised vehicles if the land meets certain criteria. Public land is sometimes open to use by off-road vehicles. On US public land, the Bureau of Land Management (BLM) decides where vehicles may be used. Railways often pass over land not owned by the railway company. The right to this land is granted to the railway company through mechanisms such as easement. Watercraft are generally allowed to navigate public waters without restriction as long as they do not cause a disturbance. Passing through a lock, however, may require paying a toll. Despite the common law tradition Cuius est solum, eius est usque ad coelum et ad inferos of owning all the air above one's property, the US Supreme Court ruled that aircraft in the US have the right to use air above someone else's property without their consent. While the same rule generally applies in all jurisdictions, some countries such as Cuba and Russia have taken advantage of air rights on a national level to earn money. There are some areas that aircraft are barred from overflying. This is called prohibited airspace. Prohibited airspace is usually strictly enforced due to potential damage from espionage or attack. In the case of Korean Air Lines Flight 007, the airliner entered prohibited airspace over Soviet territory and was shot down as it was leaving. For a comparison of transportation fatality rates, see: Air safety statistics. Several different metrics used to compare and evaluate the safety of different vehicles. The main three are deaths per billion passenger-journeys, deaths per billion passenger-hours and deaths per billion passenger-kilometers. Wikimedia Commons has media related to Vehicles. Look up vehicle or craft in Wiktionary, the free dictionary. ^ "Oudste bootje ter wereld kon werkelijk varen". Leeuwarder Courant (in Dutch). ANP. 12 April 2001. Retrieved 4 December 2011. ^ Beuker, J.R. and M.J.L.Th. Niekus (1997). "De Kano Van Pesse - De Bijl Erin". De Nieuwe Drentse Volksalmanak (in Dutch). Retrieved 4 December 2011. ^ McGrail, Sean (2001). Boats of the World. Journal of Navigation. 55. Oxford, England, UK: Oxford University Press. p. 6. Bibcode:2002JNav...55..507M. doi:10.1017/S0373463302222018. ISBN 978-0-19-814468-7. ^ "8,000-year-old dug out canoe on show in Italy". Stone Pages Archeo News. Retrieved 17 August 2008. ^ Lawler, Andrew (7 June 2002). "Report of Oldest Boat Hints at Early Trade Routes". Science. 296 (5574): 1791–1792. doi:10.1126/science.296.5574.1791. PMID 12052936. Retrieved 5 May 2008. ^ McGrail, Sean (2001). Boats of the World. Journal of Navigation. 55. Oxford, UK: Oxford University Press. pp. 17–18. Bibcode:2002JNav...55..507M. doi:10.1017/S0373463302222018. ISBN 978-0-19-814468-7. ^ "DSC.discovery.com". DSC.discovery.com. 26 June 2009. Archived from the original on 15 October 2012. Retrieved 8 January 2013. ^ a b Lewis, M. J. T. (2001). "Railways in the Greek and Roman world" (PDF). In Guy, A.; Rees, J. Early Railways. A Selection of Papers from the First International Early Railways Conference. 11. University of Hull. pp. 8–19. Archived from the original (PDF) on 21 July 2011. ^ "200 AD – MA JUN". B4 Network. Retrieved 21 July 2011. ^ Hylton, Stuart (2007). The Grand Experiment: The Birth of the Railway Age 1820–1845. Ian Allan Publishing. ^ Kriechbaum, Reinhard (15 May 2004). "Die große Reise auf den Berg". der Tagespost (in German). Archived from the original on 28 June 2012. Retrieved 22 April 2009. ^ "Der Reiszug – Part 1 – Presentation". Funimag. Retrieved 22 April 2009. ^ "Nicolas-Joseph Cugnot | Facts, Invention, & Steam Car". ^ "Automobile Invention". Aboutmycar.com. Retrieved 27 October 2008. ^ "Canada Science and Technology Museum: Baron von Drais' Bicycle". 2006. Retrieved 23 December 2006. ^ "World Vehicle Population Tops 1 Billion Units". Archived from the original on 27 August 2011. Retrieved 27 August 2011. ^ "Passenger Cars; Map No. 31". Worldmapper: The world as you've never seen it before. 2002. ^ "Mopeds And Motorcycles Map No. 32". Worldmapper: The world as you've never seen it before. 2002. ^ Niles, Russ (4 October 2007). "Cessna to Offer Diesel Skyhawk". Retrieved 5 October 2007. ^ John Pike. "Mi-8 HIP (MIL)". Retrieved 24 December 2014. ^ Kingsley-Jones, Max. "6,000 and counting for Boeing’s popular little twinjet." Flight International, Reed Business Information, 22 April 2009. Retrieved: 22 April 2009. ^ Max Kingsley-Jones (13 March 2018). "How Boeing built 10,000 737s". Flightglobal. ^ "Bicycle Power – How many Watts can you produce?". Mapawatt. Retrieved 23 July 2011. ^ WHPSC (September 2009). "Battle Mountain World Human Powered Speed Challenge". Archived from the original on 11 August 2013. Retrieved 25 August 2011. ^ "Battery Safety". Electropaedia. Retrieved 23 July 2011. ^ "The Lifecycle of an Electric Car Battery". HowStuffWorks. 2008-08-18. Retrieved 23 July 2011. ^ "Advantages and Disadvantages of EVs". HowStuffWorks. 2008-08-18. Retrieved 23 July 2011. ^ a b c "How Regenerative Braking Works". HowStuffWorks. 2009-01-23. Retrieved 23 July 2011. ^ "How do the engines breathe in diesel submarines?". How Stuff Works. 24 July 2006. Retrieved 22 July 2011. ^ "Coal and the environment" (PDF). Kentucky Coal Education. Retrieved 22 July 2011. ^ "Here Comes the Flying Stovepipe". TIME. 26 November 1965. Retrieved 22 July 2011. ^ "the heart of the SR-71 "Blackbird" : the mighty J-58 engine". aérostories. Retrieved 22 July 2011. ^ "Historical Timeline". NASA. Retrieved 22 July 2011. ^ "Can you make a rocket engine using hydrogen peroxide and silver?". How Stuff Works. April 2000. Retrieved 22 July 2011. ^ NEMA Design B electric motor standard, cited in Electrical Motor Efficiency Retrieved 22 July 2011. ^ "Pneumatic Engine". Quasiturbine. Retrieved 22 July 2011. ^ "Fact Sheet". NASA. Retrieved 22 July 2011. ^ "NASA – Innovative Engines". Boeing, Xenon Ion Propulsion Center. Archived from the original on 12 July 2011. Retrieved 22 July 2011. ^ "Frequently asked questions about ion propulsion". NASA. Retrieved 22 July 2011. ^ a b "How Car Steering Works". HowStuffWorks. HowStuffWorks. 2001-05-31. Retrieved 23 July 2011. ^ Alexander Gasser (March 2003). "World's Oldest Wheel Found in Slovenia". Government Communication Office of the Republic of Slovenia. Archived from the original on 14 July 2012. Retrieved 23 July 2011. ^ a b "Nozzles". NASA. Retrieved 22 July 2011. ^ "Week 04 – Continuous Track". Military Times. Retrieved 23 July 2011. ^ "The Biggest (and Hungriest) Machines". Dark Roasted Blend. Retrieved 23 July 2011. ^ "Early Helicopter Technology". U.S. Centennial of Flight Commission. Archived from the original on 21 August 2011. Retrieved 23 July 2011. ^ "Brief History of Screw Development" (PDF). Rod Sampson – School of Marine Science and Technology, Newcastle University. 5 February 2008. p. 10. Retrieved 23 July 2011. ^ "Cars with Propellers: an Illustrated Overview". Dark Roasted Blend. Retrieved 23 July 2011. ^ John Walker. "Vacuum Propellers". Fourmilab Switzerland. Retrieved 23 July 2011. ^ "How Sailboats Move in the Water". HowStuffWorks. HowStuffWorks. 2008-03-11. Retrieved 2 August 2011. ^ "Three Forces on a Glider". NASA. NASA. Retrieved 2 August 2011. ^ "How It Works". Project Ornithopter, University of Toronto Institute for Aerospace Studies. Project Ornithopter, University of Toronto Institute for Aerospace Studies. Retrieved 2 August 2011. ^ "Skibladner: the world's oldest paddle steamer". Skibladner. Skibladner. Archived from the original on 9 August 2011. Retrieved 2 August 2011. ^ Jean Pierre Dardinier. "Véhicules Insolites (Strange Vehicles)" (in French). Fédération Française des Groupes de Conservation de Véhicules Militaires. Archived from the original on 2 December 2011. Retrieved 23 July 2011. ^ Nice, Karim (19 September 2000). "HowStuffWorks – How Tires Work". Auto.howstuffworks.com. Retrieved 8 January 2013. ^ "The Reason for Rear-Wheel Steering". ThrustSSC Team. ThrustSSC Team. Retrieved 8 August 2011. ^ "B-52 Stratofortress Design". Globalsecurity.org. Globalsecurity.org. Retrieved 8 August 2011. ^ "Flight Crew Training Manual – Brake Units". Boeing. Biggles-Software. Archived from the original on 10 May 2011. Retrieved 7 August 2011. ^ "Landing gear system". NASA. 31 August 2000. Retrieved 7 August 2011. ^ Jennifer Schykowski (2 June 2008). "Eddy-current braking: a long road to success". Railway Gazette. Retrieved 7 August 2011. ^ "Thrust Reversing". Purdue University. Purdue University. Retrieved 7 August 2011. ^ ring_wraith. "How to land a jet plane on an aircraft carrier". Everything2. Retrieved 7 August 2011. ^ "Aircraft Museum – Tu-124". Aerospaceweb.org. Aerospaceweb.org. Retrieved 7 August 2011. ^ "ACEA.be" (PDF). ACEA.be. Archived from the original (PDF) on 21 February 2012. Retrieved 8 January 2013. ^ "Scadplus: Technical Harmonisation For Motor Vehicles". Europa.eu. Archived from the original on 15 October 2012. Retrieved 8 January 2013. ^ "Commission Directive 2001/116/EC of 20 December 2001, adapting to technical progress Council Directive 70/156/EEC on the approximation of the laws of the Member States relating to the type-approval of motor vehicles and their trailers" (PDF). Official Journal of the European Communities. 21 January 2002. Archived from the original (PDF) on 10 April 2008. Retrieved 22 July 2018. ^ "Canadian Aviation Regulations, Part IV – Personnel Licensing and Training, Subpart 1 – Flight Crew Permits, Licences and Ratings". Transport Canada. 1 June 2010. Archived from the original on 4 January 2012. Retrieved 21 July 2011. ^ "Retrieved 2011-07-21". Servicecanada.gc.ca. Archived from the original on 23 March 2013. Retrieved 8 January 2013. ^ "The Individual Vehicle Approval scheme". Directgov. Retrieved 22 July 2011. ^ "Licensing a Vehicle in Ontario". Ministry of Transportation of Ontario. Retrieved 22 July 2011. ^ "Airworthiness Certificates Overview". Federal Aviation Administration. Retrieved 22 July 2011. ^ "FAR Part 91 Sec. 91.319". Federal Aviation Administration. Retrieved 22 July 2011. ^ a b "Airworthiness Certification of Aircraft and Related Products" (PDF). Federal Aviation Administration. 18 April 2007. Section 9, subsection 153. Retrieved 22 July 2011. ^ "Experimental Category". Federal Aviation Administration. Retrieved 22 July 2011. ^ "Technical Standard Orders (TSO)". Federal Aviation Administration. Retrieved 22 July 2011. ^ Daryl Lindsey (2 November 2007). "Russia 'Blackmails' Lufthansa over Cargo Hubs". Spiegel Online. Retrieved 22 July 2011.